The information found by Speccy is invaluable when diagnosing issues, or just showing off how cool your new rig is. 1. File > Save Snapshot. This will create a file called [hostname].speccy and this can be emailed to whoever you like. 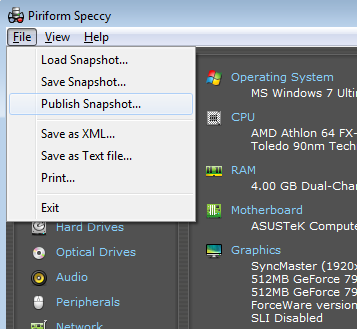 Note the person will need to also have Speccy installed to open this file. 2. File > Publish Snapshot. This saves your snapshot to our servers and then you can share the link to whoever you like. The person will not need to install Speccy. Note, for your security, there are a few settings that are not included in the published information, and we delete them all after 30 days. Looking for further technical information about Speccy?